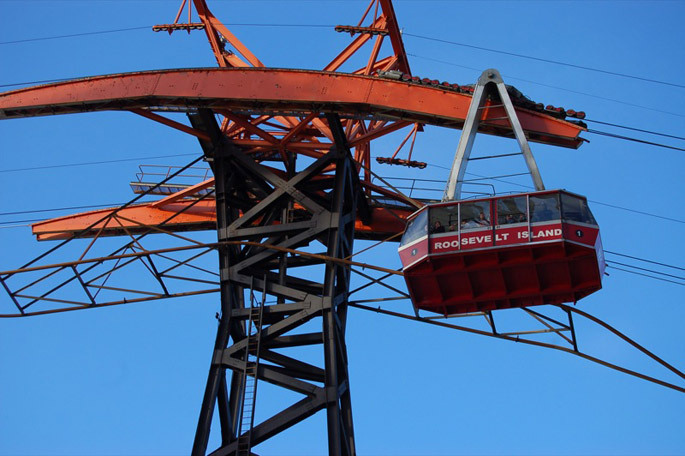 In honor of the Roosevelt Island Tramway’s 40th anniversary today, we’ve pulled this wonderful piece on the history of the high-flying gondola system from our archives. 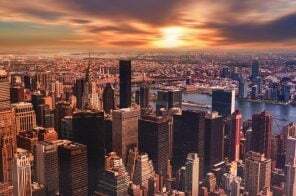 Commuting in New York City, whether for work or pleasure, is rarely an enjoyable experience. 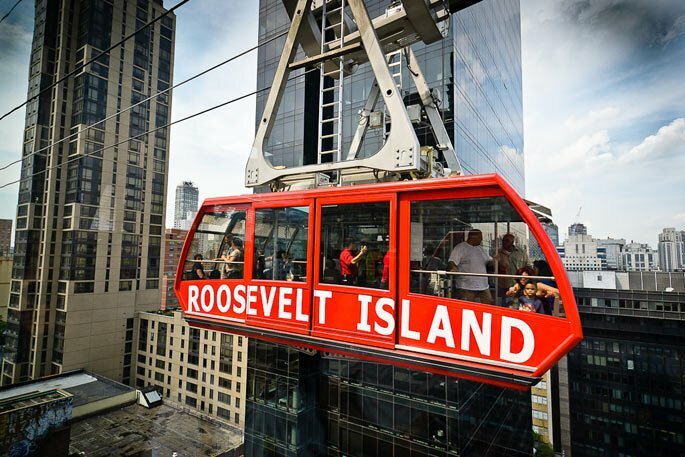 However, for some tourists and lucky city dwellers, the Roosevelt Island Tramway provides a delightful, high-flying travel alternative to the standard, and sometimes miserable, modes of NYC public transport. 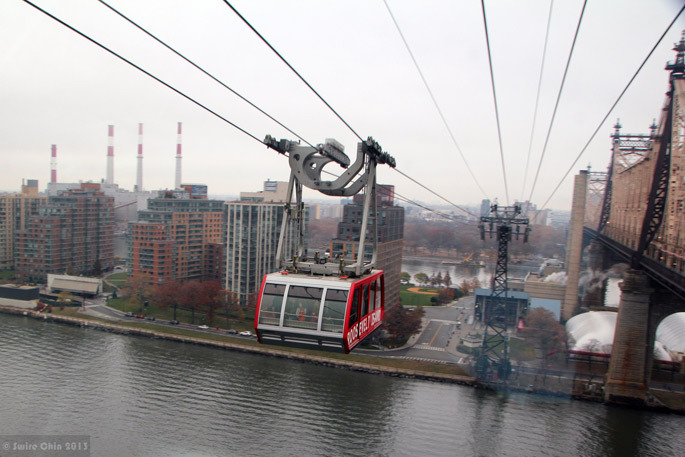 Running across the East River, this aerial tramway brings commuters to and from Roosevelt Island and Manhattan’s Upper East Side, and has carried over 26 million passengers since opening in 1976. It is one of the few forms of mass transit in New York City not operated by the MTA, but it still costs the same as the bus or subway and can be paid for with your NYC metro card. 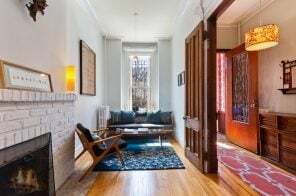 Like most things in our historic port town, both the tramway and the commute between Manhattan and Roosevelt Island has a history, and this one includes bridge elevators, high-rise rescue missions and French ski lifts. 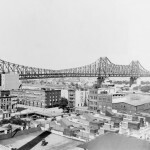 Prior to construction of the tramway, Roosevelt Island was accessed by a trolley line that crossed over the Queensboro Bridge. 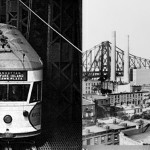 Trolleys traveling to and from Queens would stop at the middle of the bridge to meet an elevator that would then take passengers down to the island. 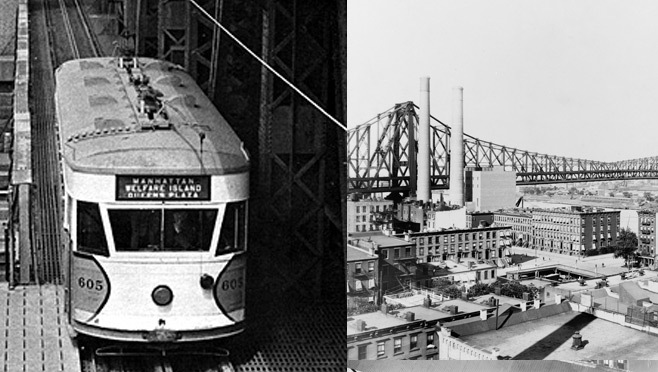 Trolley service to the island ended in on April 7, 1957, and this was the longest running trolley line in the city—kept in operation because it was the only way to get to the island. A bus line eventually replaced the trolley, but the trip was roundabout and inconvenient. 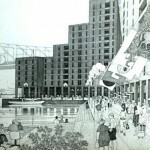 In the early 1970s, under the direction of the urban planner and visionary Edward J. Logue, the NYS Urban Development Corporation (UDC) created a model for a high-density, mixed-income urban community for the development of Roosevelt Island, necessitating a more efficient mode of transportation. 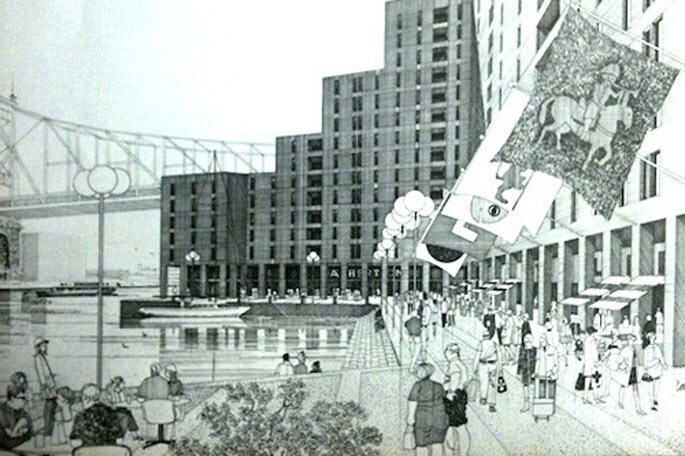 In 1971 with the trolley tracks beyond repair, and the 63rd Street subway far from completion, the UDC hired Lev Zetlin Associates (LZA) to identify and design the future connection to the island. Award-winning structural engineer James O’Kon led the LZA team through a feasibility and design study, examining three alternate modes of transit including a ferry, elevator from the bridge and an air tram. 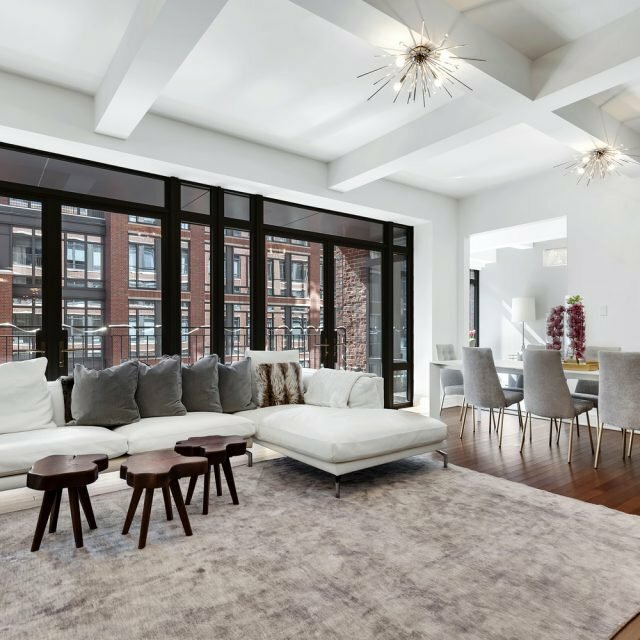 The tram was selected with the intent for it to serve as a temporary solution for commuters while the 63rd Street subway was still under construction. 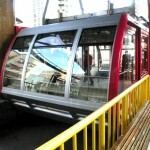 However, as the completion schedule for the new subway line was continually pushed back, the air tramway’s popularity grew and it was later converted into a permanent facility. 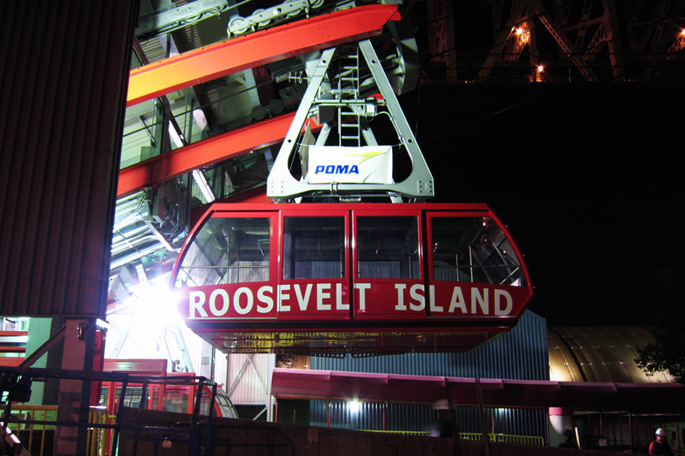 Things remained relatively breezy for the tramway until April 18, 2006 when the four-minute journey to and from Roosevelt Island was disrupted by a series of power failures leaving 70 passengers suspended hundreds of feet over the East River. 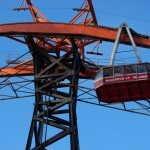 At 11PM—six hours after the tramway had stopped moving—rescuers started bringing passengers back to the ground by way of large, orange, wired rescue-gondolas capable of carrying 15 people per trip. Each trip took about 20 minuets, and the gondolas transported supplies to the remaining passengers including blankets, baby formula and food. This was the second time in eight months that power outages had occurred on the tramway, the first taking place in September of that year when 80 passengers were trapped for approximately 90 minutes. Following the April 18th incident, the tramway was shut down for a period of six months while its backup electrical system was refurbished. 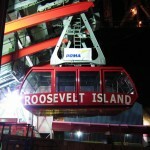 Between 2007 and 2010, the tramway’s operator, Roosevelt Island Operating Corporation (RIOC), invested $25 million to upgrade to the original structure. Their goal was to replace the existing system with a modernized tramway designed to operate in a safer and more elegant fashion. 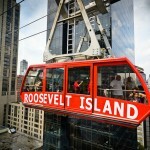 The project was formally referred to as the “Roosevelt Island Tram Modernization Project“. In November of 2008, the RIOC Board of Directors awarded the design-build contract to Poma, a French company that manufactures cable-driven lift systems mostly used in ski areas in Europe and Asia. The new modern tramway took eight months to complete, just two months behind schedule, suspending service from March to November of 2010. Fast forward to 2014, and today’s tramway boasts bigger windows, faster travel times, sturdier cabins and the ability to run both cars independently increasing rush-hour service. 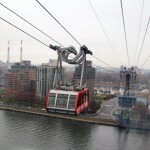 In addition to its colorful history, the Roosevelt Island Tramway provides all passengers with truly unique views of New York City. And if you’re looking for a quick getaway, the island is perfect for day trips. Roosevelt Island has several interesting landmarks including FDR Memorial Four Freedoms Park and Renwick Smallpox Ruins, and lots of green space for picnicking and enjoying the outdoors. 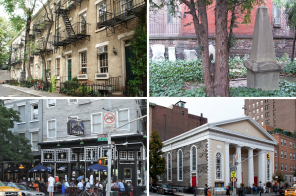 The tramway is accessible at 60th Street and Second Avenue.